Step 1 Heat the butter in a small skillet over medium-high heat. When the butter has stopped foaming and bubbling, add the mushrooms and sprinkle with salt. Cook, stirring frequently, until the mushrooms have given up their moisture, about 5 minutes. Sprinkle with shallots and cook until the shallots have softened, the moisture has evaporated and the mushrooms are quite tender, about 5 more minutes. Remove from the heat and stir in the mint and the goat cheese. Step 2 Heat the oil on a griddle over medium heat; use a spatula to distribute it so the surface is evenly covered. If you don't have a large griddle, you can use a skillet, but you'll have to cook the quesadillas in more than one batch. Add the tortillas and cook on one side until they have softened, 1 to 2 minutes. Flip them to the other side and spoon 3 to 4 tablespoons of the mushroom mixture in the center. Sprinkle over some of the diced mozzarella and use a spatula to fold the tortilla in half around the filling. Step 3Cook until the tortilla begins to brown on one side, about 2 to 3 minutes, and then flip onto the other side and cook until the tortilla browns on that side and the mozzarella is melted, about 2 to 3 minutes more. If some of the melting cheese oozes onto the griddle, that's even better. Repeat if necessary to use up all of the tortillas and filling. Step 4Serve immediately, or keep warm in a 250-degree oven until all of the quesadillas have been made. In Recipes-list.com we have selected the most viewed recipes from category - Appetizers Main courses Quick and easy Vegetarian . Enjoy the best recipes specially selected for you! 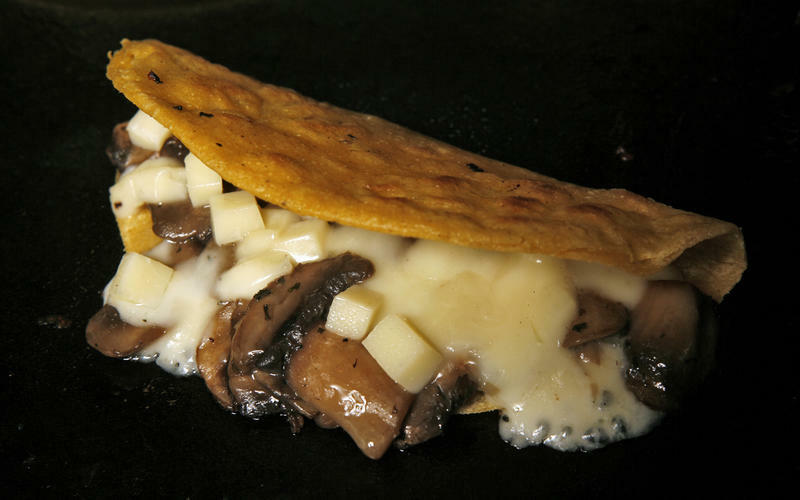 Quesadillas stuffed with mushrooms and goat cheese is the right choice that will satisfy all your claims.